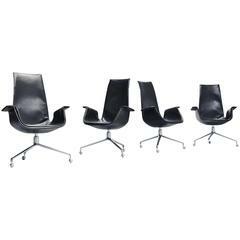 High back (executive) version of the Model FK 6725, leather 'Bird' chair, also commonly referred to as the 'Tulip' chair, designed by Preben Fabricius and Jørgen Kastholm, manufactured in Germany by Alfred Kill International during the 1960s. Chairs from this set are labelled underneath with the Alfred Kill logo, signifying these are the highly-sought-after by designers and collectors, original early production versions and not the new reproductions made by Walter Knoll. This armchair is fabricated from a fiberglass shell which is encased with original and incredibly gorgeous dark brown leather upholstery which can look burgundy depending on the lighting, making the color very adaptable - and very classy / sophisticated to boot. The leather features an admirable patina on the arms for those who love old leather, these traces of age and use bring more vibrancy to the chairs. This set has polished three prong aluminum bases, which was a signature of the designer duo's work. This Preben Fabricius and Jorgen Kastholm 'Bird' chair by Alfred Kill Intl would be a perfect addition to any design lovers interior concept. It would look commanding in any dining room, office or study as well as being an option for an accent chairs in living room, den or games room. It would also work well in a hospitality or corporate location, such as a private members club, executive office, creative space or hotel lobby check in area. Perfect fit for just about any interior or architectural style, include Mid-Century Modern, Danish / Scandinavian Modern, Postmodern, contemporary, transitional, traditional, Classical, Spanish, Mediterranean, Minimalist, and more. Consider using as dining chairs, office chairs, desk chairs, arm chairs, side chairs, club chairs, hall chairs, conference room chairs or lounge chairs. This listing is for a set of eight chairs (8) however we are willing to break the set. Price individually is $5,400/ea. Condition: Very good vintage condition. Leather and aluminum bases are all original. Patina and light distressing to areas around the arms. Great examples and ready to be used immediately. Provenance: a private collector and fine art gallery owner, Germany. Measurements: 42" H x 28" W x 30" D Seat height 17". Very good vintage condition. Leather and aluminum base are all original. Patina and light distressing to areas around the arms. Great examples and ready to be used immediately. Preben Fabricius and Jørgen Kastholm olive green leather swivel "Bird" chair for Alfred Kill International. A Bird chair by Jorgen Kastholm and Preben Fabricius for Alfred Kill. This desk chair model has the rarer Casters. Newly recovered in black Sorensen leather. 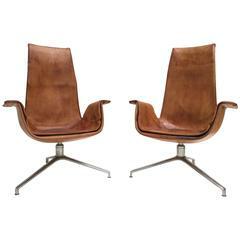 A pair of swivel base Bird chairs in cognac leather on chrome-plated steel frames. A total of two are available. Manufactured by Alfred Kill International.